This week the Ugandan national newspaper Daily Monitor published an article on a two-day training organized by Pig Production and Marketing Ltd Uganda (PPM). In the past, Ugandan farmers who wanted to upgrade their piggery or considered venturing into the business found it hard to access learning materials they could use to develop a piggery. Therefore, PPM organized a training to bring interested farmers together and facilitate knowledge transfer. The training gave insights to relevant topics such as pig feeding including additives, farm management and housing, economics including record keeping and access to seed money, pig health and zoonoses, breeding and stock management and marketing. 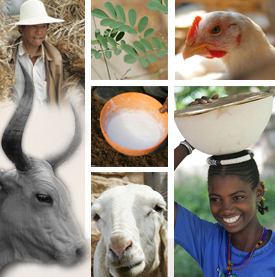 PPM and the International Livestock Research Institute (ILRI) in Uganda have worked together over the past two years. Due to this collaboration, members of the ILRI-Uganda team including postgraduate students and one national partner was among the invitees who also provided training to the pig farmers present at the event held on 14-15 February 2014. 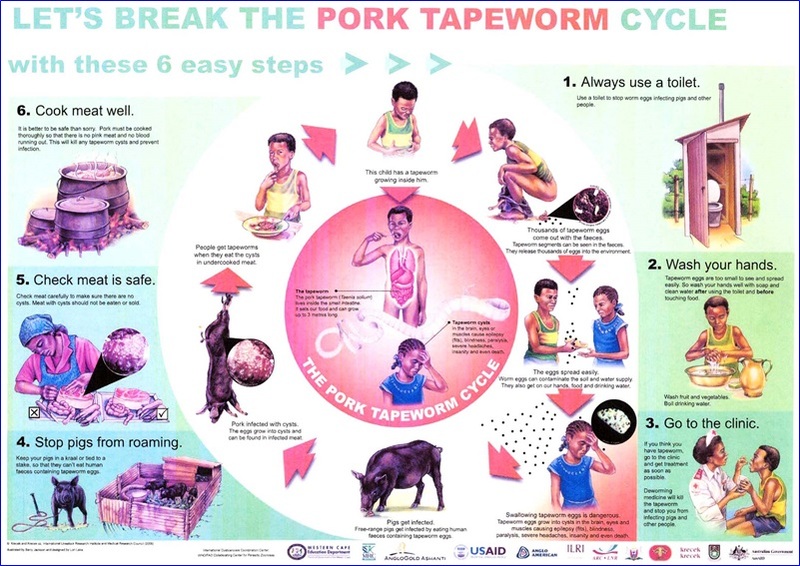 “Let’s break the tapeworm cycle”, training material developed by the WHO/FAO Collaborating Center for Parasitic Zoonoses and partners. Kristina Roesel, Safe Food, Fair Food project coordinator, was invited to facilitate a session on pig and pork zoonoses. The 90 minute session gave an introduction to zoonoses and later took the more than 50 participants through examples of pig and pork borne zoonoses that ILRI identified during the in-depth assessments in 2013. We discussed the signs in pigs and people, risk factors for disease transmission and options for their management. The prime example that caused a lot of amazement was the life cycle of Taenia solium, the pork tapeworm, which is often misunderstood. People wrongly believe that they develop epilepsy from eating undercooked pork contaminated with pork tapeworm cysts. We used a poster (see Figure above) which had previously been co-developed by ILRI and served as a real eye opener! Following the session, one of the farmers volunteered to translate it into Luganda, the local language spoken in most of Central Uganda. Tags: pork, Taenia solium, training. Bookmark the permalink.